Periodontal disease — also called gingivitis or gum disease — occurs when bacteria are allowed to thrive in your mouth and, if not properly treated, can lead to the destruction of your gum tissue and tooth loss. Gingivitis is actually inflammation of the gums that occurs before gum disease (periodontitis) kicks in. When left untreated, gingivitis can advance to periodontitis, where the inner gum tissue pulls away from the teeth and forms pockets. These pockets can become infected, leading to destruction of the bone that holds your teeth in place. Periodontal disease can be diagnosed by your dental professional and treated accordingly. 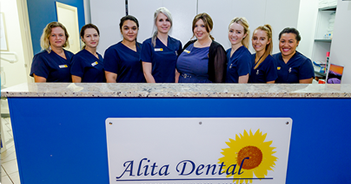 In very advanced cases, we may refer you to a specialist called a periodontist. 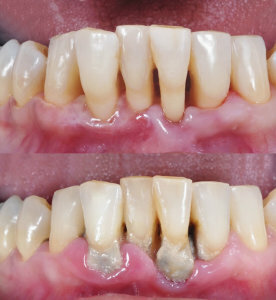 The first stage in treating gum disease is to remove the source of the inflammation. Your dentist or hygienist will remove calculus and plaque from your teeth, paying particular attention to deposits of calculus under your gum. This procedure is usually performed under a local anaesthetic for your comfort. Your dentist will clean half your mouth at your first appointment and the other half at a subsequent appointment. If the disease is fairly advanced, we may suggest more frequent visits to ensure your tissues and surrounding structures are free from irritants and that your infection is healing well. Once your tissues and surrounding structures are healthy or at least stable, we will set a time for reviews to ensure your disease does not return and your condition does not worsen.